Pinsent Masons has taken top spot for the first time in the Acritas UK Law Firm Brand Index – its seventh annual survey of UK-based law firms with the strongest brands. The results are derived from 295 interviews with buyers of legal services in the UK, and 195 non-UK-based senior counsel. The Acritas UK survey complements the company’s global brand index, in which Baker McKenzie ranks number one. Alongside private practice law firms, Acritas now ranks alternative legal service brands, with Thomson Reuters coming first on the strength of its Practical Law brand. Jo Aitken from Acritas analyses this year’s results in the video below. Read this interview for more on Acritas. 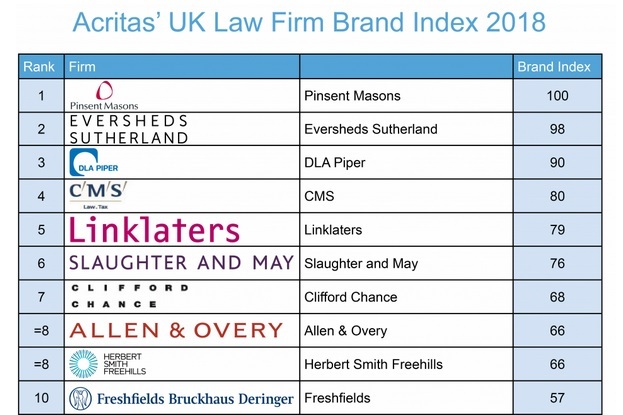 Share the post "Acritas UK Law Firm Brand Index 2018"